A place to share my story, my work, my life, my students' works as well. Enjoy it. Our school held two events connected to Aidil Adha occasion. 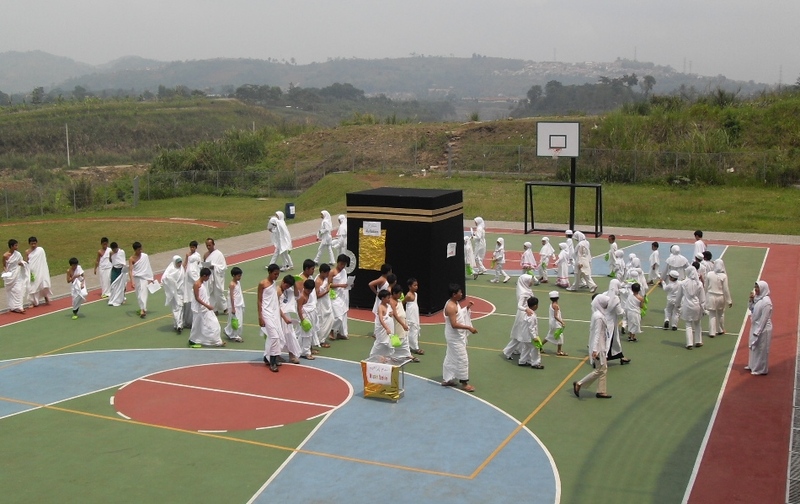 The first one is Manasik Hajj, where the students were taking part on that activity. Not every students… just Kindergarten 2 students, Primary 5 & 6, and Secondary 2 & 3. It was held on Thursday, 5 November 2009 in our school area. The students and some teachers were wearing white clothes which is called ihram garment, just like when they are doing ihram for real. They did all processions of Hajj, starting from shalat sunnah Ihram in school’s mushalla. After that they are heading to “Arafah” while keep reciting talbiyah, continued by mabit (stay) in “Muzdalifah ” and get some pebbles for jamarat activity. Continuing their journey, they did mabit in “Mina ” and throw the stones on jamarat procession. They went to “Makkah,” did thawaf, sa’i, and tahallul qubra (trimming hair). They also did thawaf wadha before they leave Makkah. All these processions were being led by Ms. Anne, the only teacher who has had perform Hajj before, when she studied in Al Azhar Cairo, Egypt. It was a great activity. The students were enthusiastic. They were joyfully take part in this activity. The other also being inspired, may someday we would be able to do the real processions of Hajj/pilgrimage, the holy trip to Makkah. Insya Allah. There were three cows and more than 40 sheeps being slaughtered. School staffs, along with the students and KBPa’s staffs were busy chopping off the meat, bone and fat, also packing it in plastic bags to be distributed to people in need. This activity was done by 3 PM, made us tired but releaved, that we can do it in our community. May Allah please with us, and draw us closer to His blessing. Amiin. Love culture in general. Love live as it is universal. Love Allah above all. This entry was posted in School Event. Bookmark the permalink. Bismillah… saya juga ingin sekali menjalani prosesi berhaji. Ketika niat sudah diazzamkan, insya Allah Allah akan memberi jalan. @Pak Erfano: Amiin. Ayo, kita saling doakan. Saya juga mau dong… naik haji. Insya Allah, suatu saat nanti. Amiin. Saling mendoakan ya, mas Adnan.